My weekday run last week was good, slow and steady as I was trying to catch up with my training plan. Good thing I was able to finish all my distances without feeling any pain on my right knee. So I figured, my knees are well so I decided to do my LSD run yesterday with my friends. The route was the same, Paseo - Nuvali – Lasalle - Westgrove - Paseo. We assembled at 4:45am (supposedly 4:30 am) in front of Jollibee at Paseo de Sta Rosa. At the same time, we met the Takbo.ph runners who were about to do their LSD run at the cardiac hill-upac trail. Neil (Crashnburn) was there and introduced me to some of the members. I’m sure they had fun exploring the trail. My scheduled run yesterday was 21km. 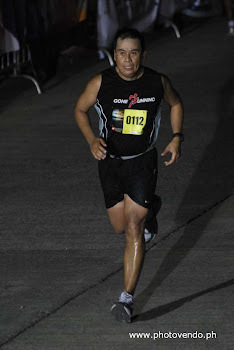 The first 4km (turn-around point at Nuvali) was good, conscious about my knee I slowed down my pace and was hoping that I could last the whole distance. However, I got frustrated reaching 8km (back to paseo) as pain started to show up in my right knee. I slowed down on my way back from Nuvali, then at 9km (in front of Technopark), pain was unbearable so I decided to walk and proceeded to Lasalle route and back to Paseo to finish 15k distance. I knew I did proper stretching before the start of the run. Thinking that my weekday run was pain-free, it made me believe that I am ready for my long run. However, I didn’t event finish a straight 10k. Then I ask myself, what’s wrong? Was it the way I run? Was it my shoes? My posture? My weight?, or simply I needed more time to rest to recuperate? Why am I even writing this? I have noticed that since I mentioned my injury after the Mizuno run in June, I have never really recovered. I guess I never learned, and I actually feel embarrassed posting this. But I figured, this is my journal and I would someday look back and see how I progressed, and at the same time this experience would become useful to new runners like me and hopefully don’t make the same mistake I did. Being persistent is good, but being patient is better. I have heard friends and runners told me that I might be doing it “too fast and too soon”. This is one of the common pitfalls of athletes, regardless of what fitness regimen they are in. They tend to push themselves to the limit to achieve their goal fast. Losing weight, or being able to run a long distance, or to run faster will not happen soon because you simply believe that you can. I am an optimist and somehow I realized that though attracting positive thoughts are good, it has certain limitations as it does not guarantee that you can achieve your goal by simply believing. You have to listen to your body and put discipline really on how you balance your training. My body may have given me signs to slow down, and this injury might be one of it, and I refused to listen. Prior to my commitment to pursue running, I was very active in mountain biking (until now). I have my weekday ride in the morning before going to work at least 2 times a week plus a long ride every Saturday. I have even experienced “hitting the wall” due to lack of preparation in one of my ride (lacks sleep, bad stomach, lacks energy). After a week of rest, I went on again with my bike routine. I am very active and always busy, enough to realize that I am overdoing it. By pushing yourself, you are not honing your body, but instead destroying it. I often tell some of my friends to stop smoking as it will destroy your body eventually, but I realized that I have become the cigarette of my body as I refused to listen to slow down and rest. I thought I was doing it right, but instead I was overdoing it. As I was talking to my friend Mike (The Transformer) earlier today, he reminded me of the question, why do you run? I have just recently asked my co-members in “Gone Running Club” this question so that each one can define for themselves the reason why they do it. I remember answering this question before that “Aside from being fit and healthy, it gives me a moment to think clearly, it is freedom when you run. Likewise, the joy of running simply allows you to take control and brings out the best in you.” Apparently, it has given me a different perspective, the competitive side of me began to overshadow the main reason why I run. It took me out of focus, and the pressure of achieving a specific distance over a period of time has been the motivation on why I run, and I realized that I am not enjoying it anymore. The injury simply prevents me from enjoying it as it keeps me sad, frustrated, and sometimes hopeless. All these things I knew from the start, I even advise my friends not to push themselves hard, not to start “too fast , too soon”, get enough sleep, focus, and I can go on. However, I realized that I am not doing it myself. I maybe a good adviser and motivator, but then again, I realized that I was not walking the talk. Sometimes people are reminded to slow down or stop when they feel pain or when they are too exhausted to enjoy what they are doing. Too much excitement and motivation sometimes gets in the way especially If you don’t listen to your body. In a way, it is better to experience a fall in order to better understand what you are trying to share with others. The Knight will rest and will recuperate. He is humbled and will go back stronger and wiser.